Participating actors are scheduled for a fifteen-minute recording session at a studio in downtown Chicago. An experienced session runner records each actor delivering a brief personal interview, two pieces of commercial copy, and a one-minute monologue or scene. This is not a class or coaching so some previous on-camera training is recommended. 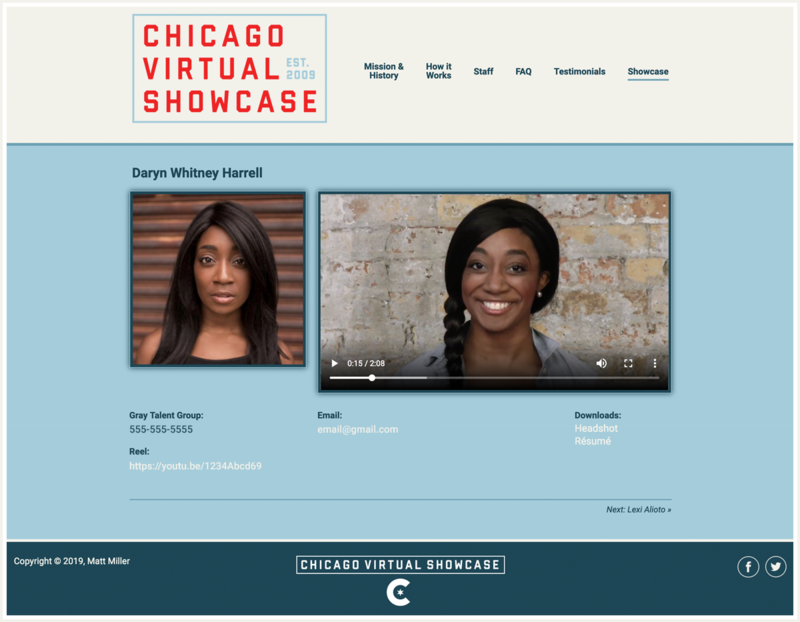 After the recording session, an editor cuts the footage for each actor and posts the videos for all of that month’s participating actors along with their headshots and resumes to a password protected link on the Chicago Virtual Showcase website. The showcase link is then emailed to an ever-growing list of industry professionals. For starters, the link is sent to all the major casting directors in Chicago, every SAG franchised talent agency, a bevy of theatres, and over 100 directors, producers, photographers and independent filmmakers. Each showcase is active for a full year. Interested? Email us to register. The next recording date is April 18th.